Coinciding with the celebration of many traditional events and festivities in Spain, for instance the already famous “San Fermínes” all over the world, I would like to introduce you a bit more in this latin culture, beyond the topics and stereotypes about our country. After several months living on the Latvian Baltic shore, I realized and discovered how much curiosity and admiration my country wake up in the native people; Southern lands between seas and oceans, full of amazing valleys and mountains dying where the most warm beaches birth. Easygoing and hospitality people in an atmosphere of charming multiculturalism. And of course the bulls. The famous “Spain of bulls”. Honor and courage. Sand, blood and glory. Epic words to define the “Fiesta Nacional”, or “National Festival”, exported everywhere. But… What really the Europeans know about this tradition, beyond the proud bravery of the noble animal that represents us? To have been crossing this continent living in different places and enriching myself with their different cultures, had makes me aware about the responsibility to represent your land away from home. Therefore, I feel the needed to share with you the most popular and traditional Spain, introducing yourself into the harsh reality of the topics. It’s common to identify Spain with the bullfighting every time that somebody speaks about. What’s behind that? The tauromachy, more commonly known as “corrida de toros” (literally “race of bulls”), was born Spain in the twelfth century. The protagonist is a particular bull’s breed, a powerful animal around 500 Kg who has been trained and prepared during several years for this event. In the sand of the bullring, he will stand face to face against some humans making the spectacle: The “matador” or killer, and assistants: three “banderilleros” or flagmen, one “mozo de espada” or sword page, and the “picador” or lancer, riding a horse. Six specimens give life to the event, two for each matador and during twenty minutes and half an hour every one of them. During the show, the bull get around six “banderillas” (70-78 cm harpoons), is speared by a stick five feet long, and pierced by a sword for the matador, who will try to kill the animal hitting through the heart. Otherwise, he will be topped with a fatal stab in the nape of the neck. The rewards after this “equal” battle between men and beast will be the ears and tail… of the bull, in this case. Up to now, more than half hundred of “matadores” lost his life in the bullfight spectacle. 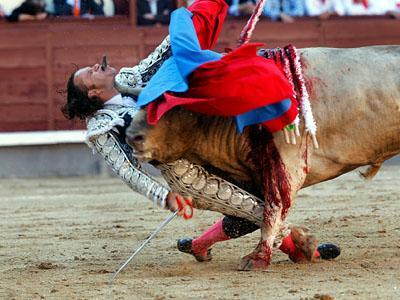 The bullfighting is normally fatal for the bull, and it is also dangerous for the matador, who also is risking his life. Last May, matador Julio Aparicio suffered an injury in which the bull’s horn punctured the underside of his chin and exited through his mouth. Is it a part of the spectacle as well? Recently named last May in some communities as “interest cultural event”, Spanish society are split up between favorable and against bullfight. Actually, the Catalonian region debates the legality of the “national party” in a Popular Legislative Initiative, with a big social support calling for the abolition. Meanwhile, Canary Islands region had already forbidden since 19 years. Journal critics, farmers, bullfighters and businessmen are living in Spain about this business that every year moves millions of euro. Powerful economic interests are diverting the ethic discussion of their practice. Sport, art, and tradition are some of the adjectives to defend the bullfight practice. But, since which historical moment the cult of violence has been worth to perpetuate in time? It’s a compelling reason to hold it just for being a hundred-years-old tradition? Isn’t always cruelty, whether the victim is a human or animal? When even the most basic act as can be the fun has its ground in the suffering, torture and annulment of a living being, it’s time to seriously analyze what’s wrong in our humankind. The world is turning around through the history, repeating the same mistakes in every corner, making us prisoners of a cyclical fate. But even in an earth full of grief and suffering its place to hope of the human awareness. Each society and every one of us still leader of our destiny, and able to change it. Therefore, allow me just for one day to be critical with the deepest Spain. It’s time to be knows just for those things of we really can feel proud. Hence it is not my aim to build an apology of the anti-bullfighting; I’m going beyond it, until every conscience. We have an awesome culture, beautiful enough without to need promote our most entrenched medieval traditions. Only the appreciation and respectful for the Life, in its whole magnitude, can makes a real change in our societies. Spain is a good example about sensitivity and respectful in so many social fields… Will be also worthy the bull of our affection? Impresionante artículo. Un texto que llega de verdad y debería hacernos reflexionar. Los toros es un ejemplo de la violencia humana, pero una violencia pública y festival. A la mayoría nos extremecen las imágenes de crías de focas asesinadas sin la más mínima piedad, por poner un ejemplo de tantos. Sin embargo, mucha de esa gente paga por acudir a una plaza y ver como cuatro hombres torturan a un animal que ya salta herido a la arena, clavándole arpones y una enorme lanza en la columna. La gente aplaude, la gente pide la oreja!! Es la tradición, es arte… Tal vez no todos los humanos, no son humanos. Tal vez las focas no dan lástima a todo el mundo. Es hora de dar pasos hacia delante, hacia la vida,… pero ¿el ser humano quiere dar esos pasos? ¿acaso importa? Al fin y al cabo, el hombre es el Dios que rige en este mundo, y ¿qué hay más importante que uno mismo? Felicidades al Señor Ramón Couto, me ha encantado su artículo.